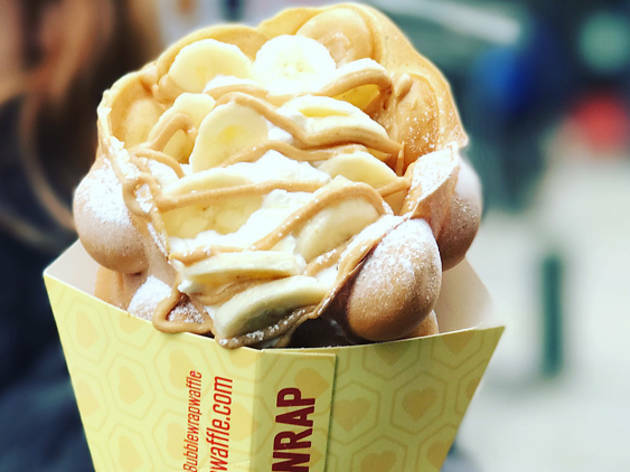 A new freaky dessert is coming to London, but WTF is a Bubblewrap? 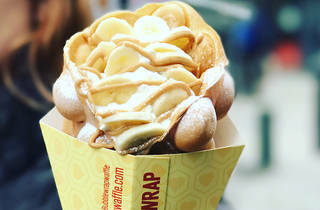 Worldwide icon-chevron-right Europe icon-chevron-right United Kingdom icon-chevron-right England icon-chevron-right London icon-chevron-right A new freaky dessert is coming to London, but WTF is a Bubblewrap? Weirdo edibles abound in this city of ours – think overflowing freakshakes, candy-floss-wrapped ice creams, vertiginous cartoon croquembouche – you get the idea. Next up? Cast an eye to the streets of Hong Kong, and the city’s longstanding super-treat, the egg waffle. First invented in the 1950s as a way of using up un-sellable broken eggs, these bulbous cones of ice cream/fruit/chocolate/sauce-filled waffle have been re-envisioned as an Instagram-primed London dessert du jour by Bubblewrap, a Saturday Berwick Street market stall, with a permanent spot opening round the corner on Wardour Street come Wed Mar 8. Flavour combos are appropriately inventive: from peach, pistachio and white chocolate in a plain waffle, to cocoa wraps with berries, sea salt and dark chocolate, or matcha waffles with mochi (rice dumplings) and red bean. Start fasting now: they're running a two-for-one opening offer for the first fortnight. It’s set to be a wrapper’s delight. Sugar fix not quite sated? Check out our list of London's most showstopping desserts. Satisfy your sweet tooth in Chinatown with one of these massive, bubbly (and totally delicious) desserts. This is not new, Nosteagia has been doing this in Shoreditch for ages! They call it bubble waffle btw! And they come with various different toppings from fruits to nuts to oreos to m&m and nutella, and different flavoured ice-creams too! Definitely worth trying! Looks delish! Can't wait to try one!